Messier 25 is about 19 lights across, covering an area of 32 arc minutes in the sky. It is one of the Messier objects that are visible to the naked eye under good conditions, with clear, dark skies and no light pollution. Messier 25 is pretty easy to locate with binoculars. It lies 6.5 degrees north and a little east of Lambda Sagittarii (Kaus Borealis), the star that marks the top of the Teapot asterism in Sagittarius. 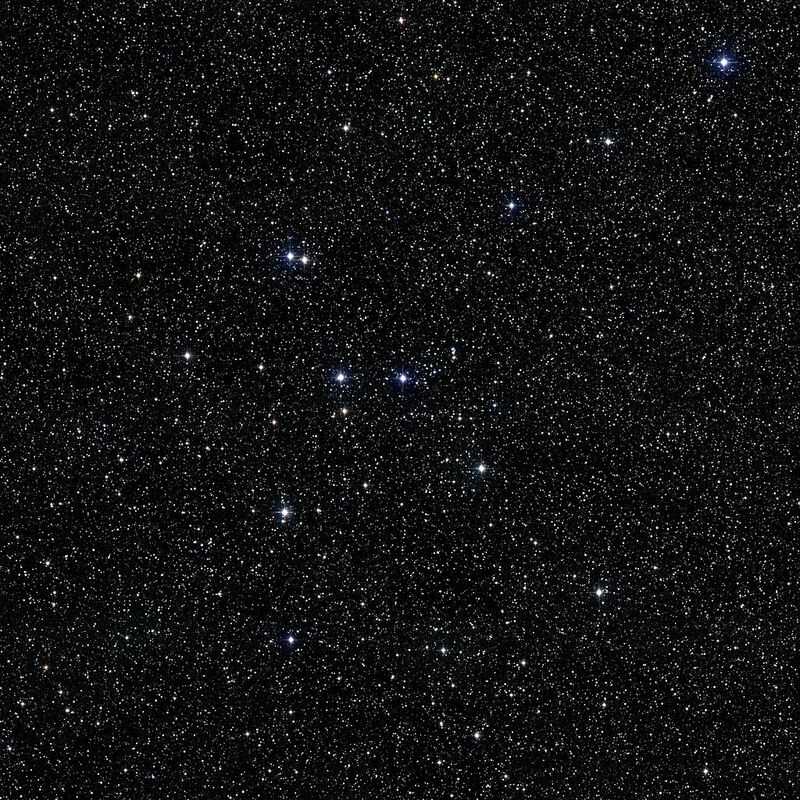 The cluster appears brighter and larger than the nearby Messier 23 and is positioned only 3.5 degrees to the west of the much larger Messier 24, the Sagittarius Star Cloud. Messier 25 is best seen in small telescopes. The brightest stars are resolved in 10×50 binoculars, but the cluster only appears as a dim patch of light. Small telescopes will reveal a large group of 30 stars, most of them white in colour, while larger instruments (8-inch and up) will show about 60 stars of different colours. The best time of year to observe M25 is the summer, when Sagittarius can be found over the southern horizon in the evening. Messier 25. Atlas Image mosaic obtained as part of the Two Micron All Sky Survey (2MASS), a joint project of the University of Massachusetts and the Infrared Processing and Analysis Center/California Institute of Technology, funded by the National Aeronautics and Space Administration and the National Science Foundation. Messier 25 contains 601 known members. The cluster is home to two giant stars of the spectral type G and appears to contain two M-class giants which are not really members of the cluster. 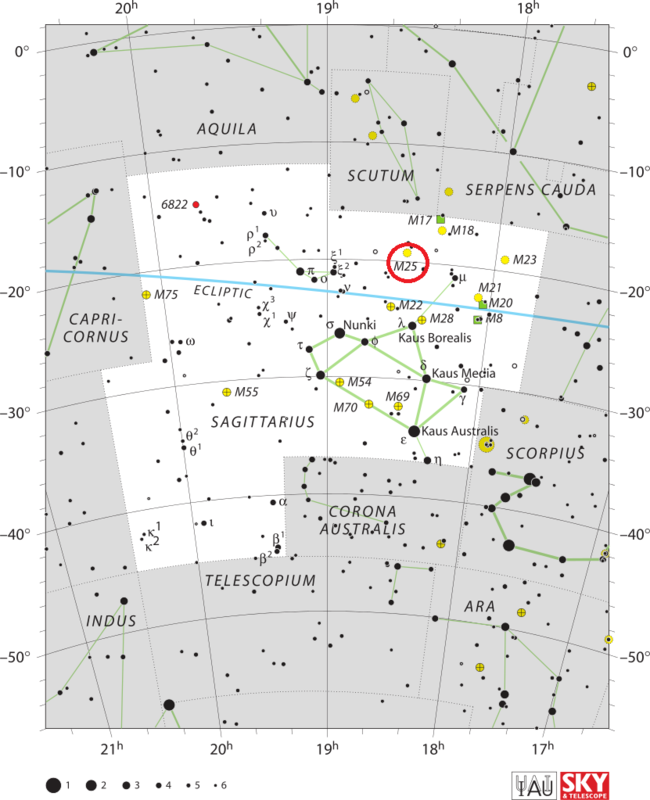 In 1956, J.B. Irwin discovered a variable star in M25. The Delta Cephei-type variable U Sagittarii has a period of 6.74 days and changes from magnitude 6.3 to 7.1. 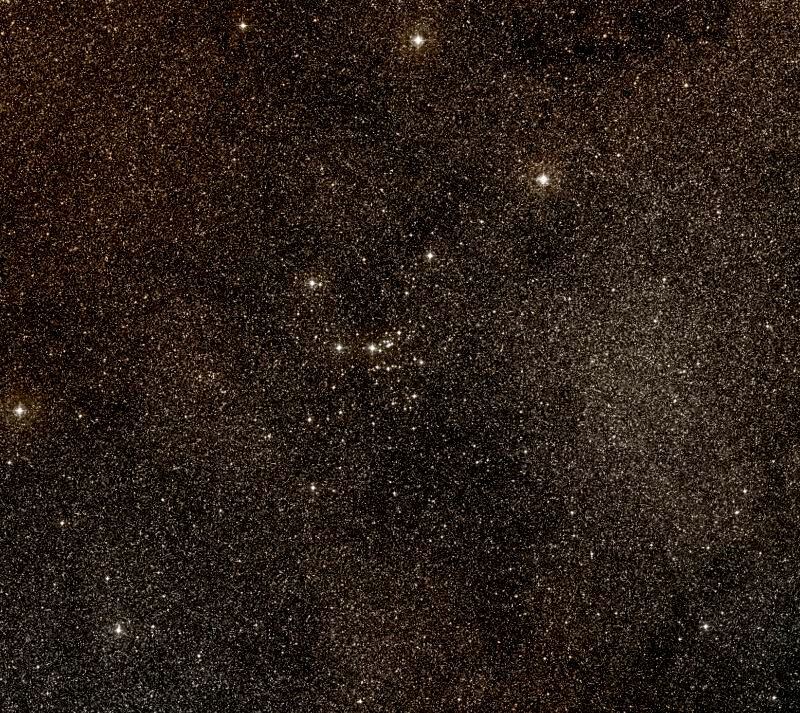 With an estimated age of 90 million years, M25 is not a particularly young star cluster. In the same night [June 20 to 21, 1764], I have determined the position of another star cluster in the vicinity of the two preceding, between the head & the extremity of the bow of Sagittarius, & almost on the same parallel as the two others: the closest known star is that of the sixth magnitude, the twenty-first of Sagittarius, in the catalog of Flamsteed: this cluster is composed of small stars which one sees with difficulty with an ordinary [non-achromatic] refractor of 3 feet: it doesn’t contain any nebulosity, & its extension may be 10 minutes of arc. I have determined its position by comparing with the star Mu Sagittarii; its right ascension has been found at 274d 25′, & its declination at 19d 5′ south. A loose cluster of large and small stars in the Galaxy, between the Archer‘s head and Sobieski’s shield [Scutum]; of which a pair of 8th magnitudes, the principle of a set something in the form of a jew’s harp, are above registered. The gathering portion of the group assumes an arched form, and is thickly strewn in the south, on the upper part, where a pretty knot of minute glimmerers occupies the center, with much star-dust around. It was discovered in 1764 by Messier, and estimated by him at 10′ in extent: it is 5 deg to the north-east of Mu Sagittarii, and nearly on the parallel of Beta Scorpii, which glimmers far away in the west. Messier 25 does not have an NGC number because, for an unknown reason, John Herschel did not list it in his General Catalogue. The Danish-Irish astronomer and astronomy historian John Louis Emil Dreyer eventually added M25 to the second Index Catalogue in 1908 using data from the American astronomer Solon Irving Bailey.